Food happens at House of Prayer. Us Lutherans are known for our fantastic spreads. This past Wednesday was no exception. A Conversation with Bishop Jim Hazelwood. "Land and People of the Bible". Over 60 HOP members and friends joined the ELCA New England synod Bishop for an evening of fellowship and good food. 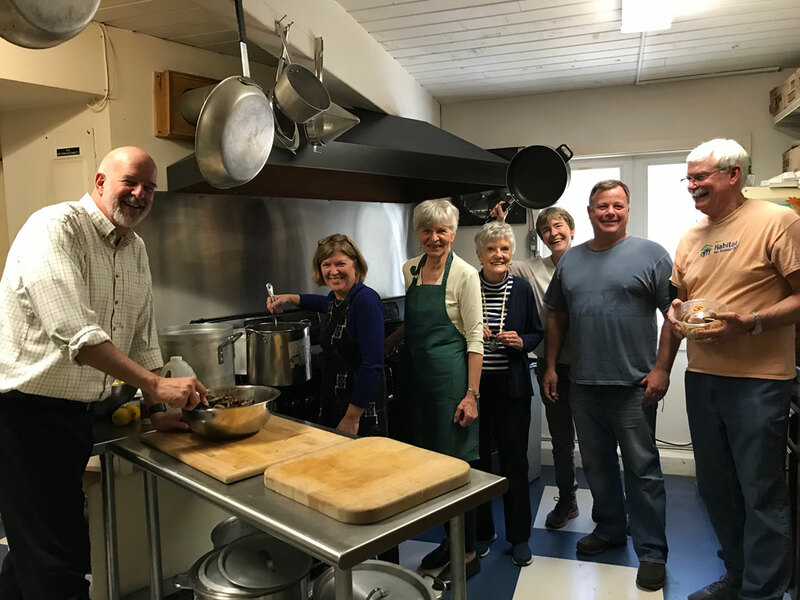 The Bishop shared his cooking skills with HOP members in the preparation of a typical Middle Eastern meal, with accoutrements supplied by HOP members. We watched an entertaining slide presentation which was a combination of bible study, tour guide & illustration of the ELCA's mission work in this complicated part of the world. And, best of all, $1200 was collected/pledged to support a scholarship for Muslim and Christian students to attend school together in the region!